1. Detroit rose and fell with the auto industry. This generalization sounds so self-evident and leads just about every piece on the city’s decline. But there’s a good case to be made that the city’s troubles were rooted partly in the prosperity that the auto industry produced. There’s the oft-cited point that the success of the Big 3 left Detroit insufficiently diversified across other industries. Less mentioned, though, is what the city’s prosperity may have done for its demographics. When crime and racial tension began rising in big American cities in the 1960s, it was easier for white Detroiters to head for the suburbs because they had the good jobs to pay for new homes out there—not to mention that many of their jobs already were out there, at the auto plants ringing the city. In cities without this base of well-paying factory jobs, the white working class was less likely to leave in droves—Philadelphia, Baltimore, and Pittsburgh, among others, still have substantial populations of white working class residents. They are not exactly thriving, but they are at least still there, keeping those cities’ vacancy rates and population loss from being even worse than they are. In Detroit, white flight simply happened at a far more rapid clip, leaving behind a population that was not only very polarized racially on either sides of 8 Mile Road (today, more than 80 percent of Detroit is African-American), but more importantly was simply not big enough to sustain the city. The prosperity curse shows up in the history of the city’s downtown, as well. It’s no accident that Detroit was home of some of the country’s first shopping malls, which over time drew more and more city residents with money to spend away from its legendary department stores downtown. Developers targeted Detroit for malls because its residents had money to spend at them. Until they didn’t. Those yoking the city’s and auto industry’s fate in clear correlation must also grapple with the fact that, even as the city files for bankruptcy, the industry is doing well. Not that that’s kept cynics willfully unfamiliar with metonymy from mocking President Obama’s claim to have kept “Detroit” from going bankrupt. 2. Detroit suffered when black elites replaced the more capable white ones. True, Detroit has had its share of lousy and corrupt leaders in recent years. But its city fathers weren’t that much to write home about even in the good old days. This, too, is linked to the centrality of the booming auto companies to the local economy. In cities with more diversified economies, with the customary mix of banking, real estate, insurance, health care, etc, there is a core of business leaders who are invested in the city and, most importantly, in its downtown, not least because that’s where their own offices tend to be. That’s where they go to the gym, where they go to lunch. Self-interest in keeping things up reinforces their civic instincts. 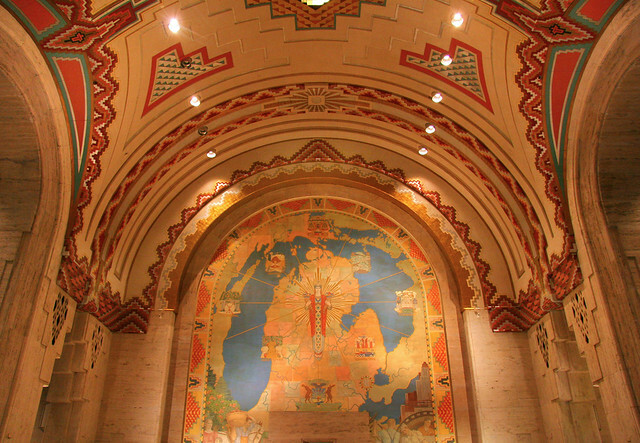 Detroit had plenty of civic pride—as the stunning Michigan mural inside the Guardian building suggests, showing the state gleaming above the rest of the country—but it had fewer of these town fathers, because its business leaders were auto executives who were not stationed downtown and, in several cases, openly disdained the city. Henry Ford was such an anti-urbanist that he built a faux-small town for himself outside the city. 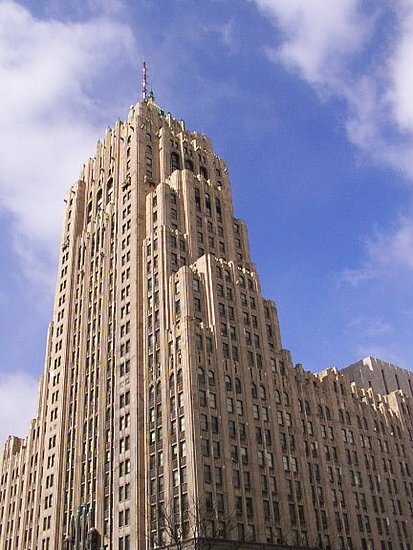 When GM moved its headquarters from Flint to Detroit in the 1920s, it settled on a new complex several miles north of downtown, “New Center”; by the time it came downtown in 1996, to the fortress-like, incongruously gleaming Renaissance Center towers, the game was up. 3. Detroit is the victim of city-suburb boundaries that perpetuate inequities. This theory was floated last night by, of all people, Paul Goldberger, the highly-regarded former New Yorker architecture critic. He wrote on Twitter: “Detroit also crippled by tight boundaries, as if drawn to leave out any part of the region with taxable value.” Um, no. What Goldberger is describing is something that has indeed crippled other older American cities, where well-to-do areas quite close to the city over the years carved themselves out as standalone municipalities, thus depriving the city of their tax base—think of Shaker Heights and Cleveland, Brookline and Boston, and University City and St. Louis (Jonathan Franzen’s first novel was, on one level, about the imperative for St. Louis to reclaim suburban territory.) But this has most definitely not been Detroit’s problem. In fact, the problem there is almost exactly the opposite: the city has too much territory—139 square miles, enough to fit within its borders all of Boston, San Francisco and Manhattan (one of the most incredible factoids ever.) Once, this land was a blessing—it is why immigrants and their descendants skipped over or fled New York in the early 20th century for Detroit, because it was a city where families of modest means could afford not just a tenement apartment but a whole house with a yard. But as the city’s population declined, the land became a curse—so much territory to cover with city services (sanitation, transit, police and fire) and such distances for residents to travel for the dwindling pockets of employment and retail. In cities that truly have “tightly drawn boundaries,” city residents at least don’t have to travel that far to get to jobs in the suburbs. In Detroit, they have to get to 8 Mile (called that for a reason) and far beyond. 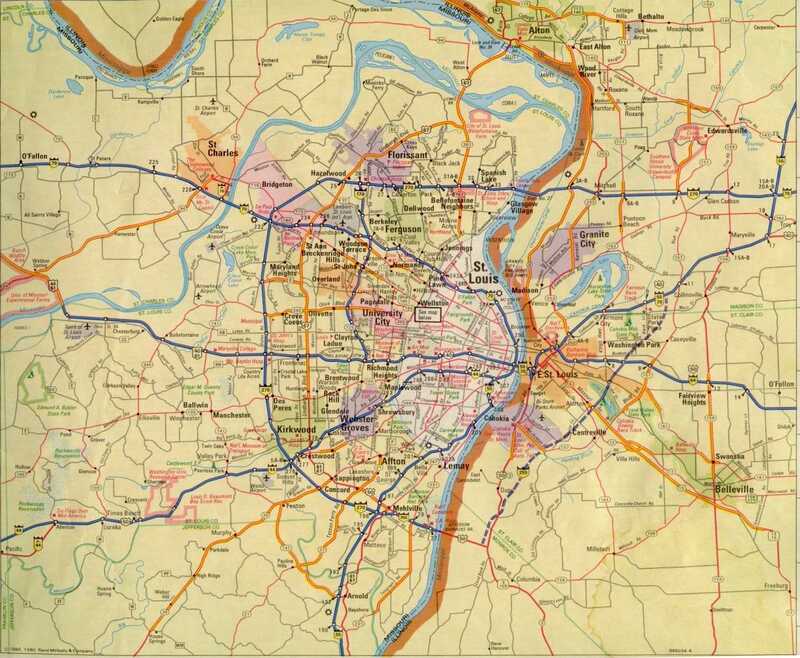 Yes, the region is astonishingly segregated between its city and suburbs. But no, it is not the result of the nefarious drawing of city lines, as elsewhere. Goldberger, for what it’s worth, dug the hole deeper in our Twitter exchange by arguing that boundaries were drawn in such a way in Detroit that people of means never resided in the city—“even in better days all the money lived in suburbs.” Again, that’s simply not the case. The city is full of grand (now shockingly affordable) homes for a reason. One that was recently demolished was once owned by the classic example of old Detroit money: the family of Mitt Romney. 4. Detroit is full of great old buildings just waiting for urban pioneers. We’ve heard so much about all the vacant buildings in Detroit and the budding return of deal-seeking hipsters that there’s an assumption that the city is just waiting to be discovered by a wave of new residents of the sort that are flooding into Brooklyn and Washington but also, in smaller numbers, parts of Baltimore, Philadelphia and Pittsburgh. What this misses is one of Detroit’s cruel ironies: while it has many, many vacant buildings available for a song, it lacks the sort of housing stock on which urban renaissances are born. The “urban renewal” wave of the 1950s and ’60s was more disastrous in Detroit than anywhere else—to make room for a web of new expressways (built partly to speed travel among the big auto plants on the periphery), the city knocked down not only a major African-American neighborhood (thus contributing to the racial tensions that spawned the 1967 riots) but also a swath of buildings on the southwest corner of downtown, exactly the sort of warehouses and small factories that have been reborn as loft apartments and condos in other cities. There are also precious few of the brownstones and other rowhouses that are so popular with gentrifiers in other cities. 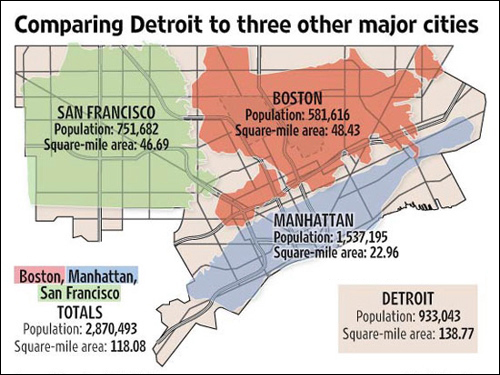 As Jane Jacobs explained years ago, cities thrive on density, but Detroit, for the reasons described above, was always more spread out than other big cities. What is mostly left for housing, with the exception of rejuvenating pockets like the Midtown area around Wayne State and the Detroit Institute of Art, are some breathtakingly handsome Art Deco towers downtown in various stages of vacancy, and a sea of single family homes scattered across the vast expanse, offering less than ideal raw material for the sort of bikes-and-coffee-shop comeback we’ve seen in other cities.